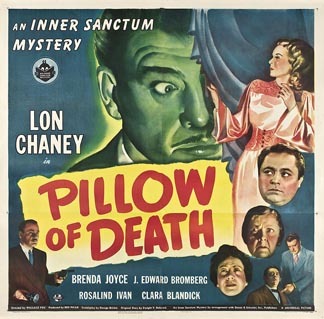 Wallace Fox’s Pillow of Death, the sixth and final film in the Inner Sanctum Mysteries series, is a haunted house mystery, the kind that Charlie Chan and the Crime Doctor excelled at solving. It lacks the ghoulish fun of the Inner Sanctum radio show, and it’s the least memorable of the film series. 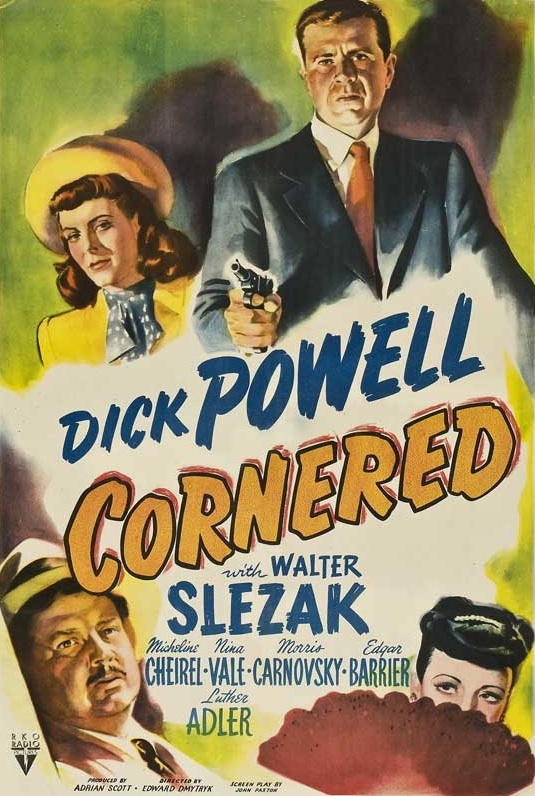 The film begins when attorney Wayne Fletcher (Lon Chaney, Jr.) drops his secretary Donna Kincaid (Brenda Joyce) off at her family home after another late night of preparing briefs at the office. The crotchety patriarch of the family, Sam Kincaid (George Cleveland) grumbles, “The Kincaid women never worked,” which is funny, considering the fact that his sister Belle (Clara Blandick) waits on him hand and foot, and he employs Amelia Kincaid (Rosalind Ivan), a poor relative from England, as his housekeeper. When Fletcher returns home, the police are waiting for him in his living room. Capt. McCracken (Wilton Graff) and his men acted on a tip from a spiritualist named “Julian” (J. Edward Bromberg), who is sitting in Fletcher’s rocking chair like he owns the place. The police inform Fletcher that Julian had a psychic presentiment that one of his adherents, Mrs. Fletcher, had come to harm. When the police arrived at the Fletcher home, they found her murdered corpse. Fletcher is now the prime suspect. After he’s questioned and released, Fletcher goes to the Kincaid home, as does Julian, and most of the rest of the film takes place there. Donna’s amorous teenaged neighbor Bruce (Bernard Thomas) keeps popping up, skulking around the grounds and saying little, as the bodies start piling up. The haunted house clichés come fast and furious, including a séance presided over by Julian, which gives the roly-poly character actor Bromberg free rein to tilt his head back, roll his eyes up in his head, and speak very, very slowly. 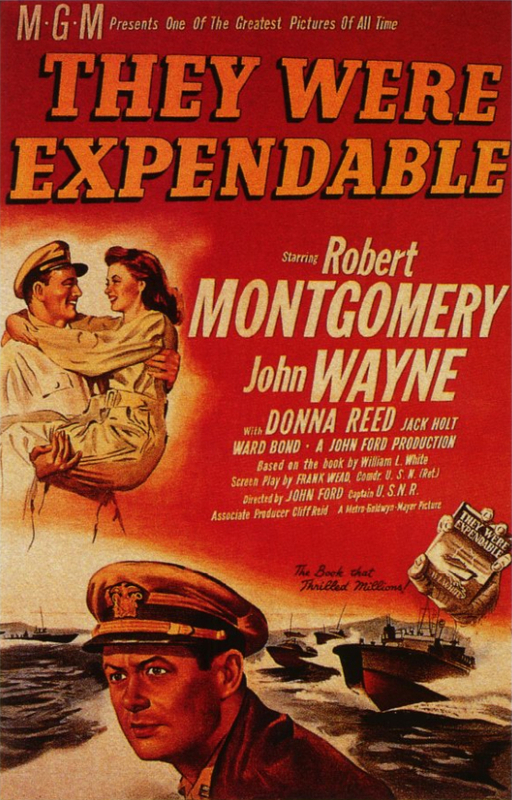 It’s not quite entertaining enough to be called “campy,” but it comes close. Unlike the previous films in the series, the supernatural element is poorly handled and its role in the story is never fully explained. In other Inner Sanctum films, and on the radio show, any supernatural hokum was usually debunked and explained away. Like pulling the mask off the monster at the end of Scooby-Doo, the explanations were sometimes preposterous, but they were usually clever, or at least fun. And since Pillow of Death a straightforward mystery, the lack of explanation seems more like a product of lazy writing than anything else. Also, with a title like Pillow of Death I was expecting something more overtly supernatural, like a pillow cursed by Satan, or a talking pillow, or possibly even a pillow with a hole in it full of sharp teeth. Instead, an ordinary pillow is used at one point as a murder weapon, in an attempt to smother someone, but that’s it. Given the pillow’s limited role in the film, the title seems almost like a joke. Posted in 1945, December 1945 and tagged Ben Pivar, Bernard Thomas, Brenda Joyce, Clara Blandick, Dwight V. Babcock, Edward Curtiss, Frank Skinner, George Bricker, George Cleveland, Inner Sanctum Mysteries, J. Edward Bromberg, Jerome Ash, Lon Chaney Jr., Mystery, Pillow of Death, Rosalind Ivan, Universal Pictures, Wallace Fox, Wilton Graff. Bookmark the permalink. 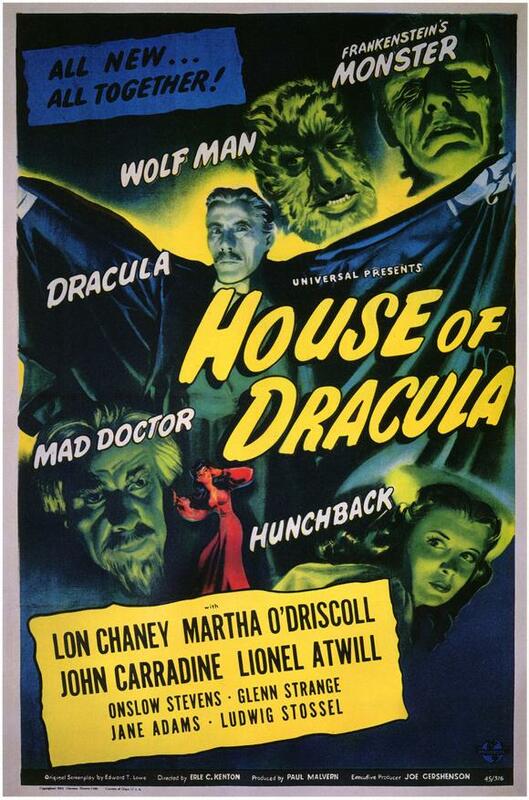 House of Dracula followed in the footsteps of Frankenstein Meets the Wolf Man (1943) and House of Frankenstein (1944), Universal Studios’ earlier “monster mash” movies. It would be a few years before the genre descended into outright self parody, but House of Dracula is still campy and fun compared with the more serious scares of Universal classics like Dracula (1931) and The Wolf Man (1941). The macabre goofiness begins with the opening credits, which drip down like blood dumped on the roof of an A-frame house, coalescing over a shot of a creepy old manse, high atop the cliffs on the shores of what looks suspiciously like the Pacific Ocean. Like most Universal horror movies, House of Dracula seems to takes place in “Europe,” but the details are vague, and everyone speaks English, even though the characters have names like Holtz (Lionel Atwill), Siegfried (Ludwig Stössel), and Dr. Franz Edlemann (Onslow Stevens). The last time we saw John Carradine as a tall, white-haired, and mustachioed Count Dracula, he was burned up in the sun halfway through the running time of House of Frankenstein. How he came back to life is never explained. How he manages to walk into Dr. Edlemann’s castle without being invited in is also a mystery. But walk in he does, through an unlatched back door, and presents himself to Dr. Edlemann as “Baron Latos.” Dr. Edlemann is a scientific genius with a hunchbacked assistant named Nina (Jane Adams) and a basement full of crazy doodads and contraptions. He is also an expert on the affliction of vampirism. Dracula wants to be cured, and Dr. Edlemann agrees to help him. The plot thickens when, one evening shortly after sundown but before the rise of the full moon, Dracula is receiving a blood transfusion from Dr. Edlemann in his basement laboratory. A nervous man named Lawrence Talbot (Lon Chaney, Jr.) appears in Dr. Edlemann’s waiting room. Like Dracula, he is looking for a cure. Dr. Edlemann’s pretty nurse, Miliza Morrelle (Martha O’Driscoll), tells Talbot he’ll have to be patient, but he refuses to wait. “There isn’t time!” he shouts, and runs out of the castle, directly to the nearest police station, where he convinces them to lock him up. He transforms into the dreaded Wolf Man while behind bars, which convinces Dr. Edlemann to take him on as a patient. Miliza refers to Talbot as a “young man,” and Dr. Edlemann calls him “my boy,” which are both strange appellations for a tired-looking 39-year-old alcoholic with slicked-back hair and a mustache. His behavior is also strange, but that’s standard operating practice for the Wolf Man’s human alter ego in a Universal horror movie. After a setback, the impatient Talbot unsuccessfully attempts to commit suicide by jumping from the cliffs. The doctor follows him down to one of the seaside caves, where he tells him the conditions are perfect for growing his mold spores, and not to despair. While in the caves, the plot thickens once again when Talbot and Dr. Edlemann find Frankenstein’s monster (Glenn Strange), buried in mud along with the skeleton of Dr. Niemann, who revitalized him back in House of Frankenstein. The villagers chased them into a pit of quicksand, and the mud flow brought them to the caves below Dr. Edlemann’s castle. The altruistic Dr. Edlemann belts the monster down on an operating table, and wires him for revival, but his reasons for doing this are less clear than his reasons for helping Dracula and the Wolf Man. He says that to not do so would be murder, since the monster is man’s responsibility. (Presumably, if he could speak, the monster would say, “Please bring me back to life so I can destroy you, your laboratory, your home, and everything you’ve worked for.”) Nina and Talbot eventually manage to dissuade Dr. Edlemann from bringing the monster back to life. However, the monster is still hooked up and ready to be reactivated, like a loaded gun carelessly left lying on the floor of a mental institution. Things start to go south at the halfway mark of House of Dracula, as they tend to when monsters mash. Dr. Edlemann doubles up on the transfusions he’s giving to Dracula, which leads to a fateful accident. Meanwhile, the irrepressible Count casts his hypnotic spell over Miliza, with whom he has a past. I thought that House of Dracula was a more satisfying picture than House of Frankenstein. The way each monster is introduced is clumsy, but other than that the plot flows smoothly from beginning to end. It’s a spooky good time that doesn’t strain to fit all of its ghoulish pieces into its 67-minute running time. Posted in 1945, December 1945 and tagged Dracula, Dwight V. Babcock, Edward T. Lowe Jr., Erle C. Kenton, Frankenstein, George Bricker, George Robinson, Glenn Strange, Horror, House of Dracula, Jane Adams, John Carradine, Joseph Gershenson, Lionel Atwill, Lon Chaney Jr., Ludwig Stössel, Martha O'Driscoll, Onslow Stevens, Paul Malvern, Russell F. Schoengarth, Skelton Knaggs, The Wolf Man, Universal Pictures, William Lava. Bookmark the permalink. 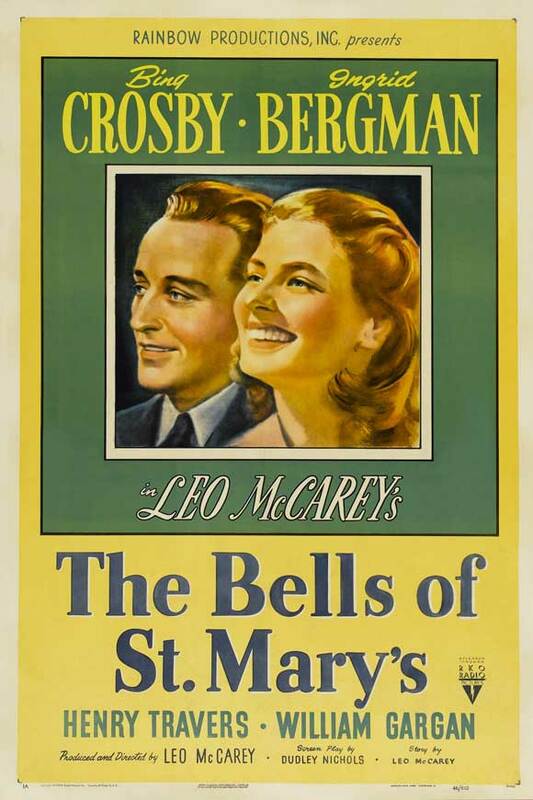 In The Bells of St. Mary’s, Bing Crosby reprises the role of Father O’Malley, for which he won an Academy Award for best actor of 1944, and he is joined by Ingrid Bergman, the best actress winner of 1944 (for Gaslight). The talent pool might be heavy, but the film itself is pretty light. There’s a disease, but it’s not fatal; there’s a bunch of needy kids running around, but the word “orphan” is never heard; and the sisters are in danger of losing St. Mary’s, but keep your fingers crossed for a Christmas miracle. Like a lot of sequels, The Bells of St. Mary’s sticks with the formula of its predecessor. Father O’Malley is still the new guy in town, he’s still freewheeling and freethinking, and he butts heads with the other members of the clergy. His foil in Going My Way was Barry Fitzgerald as a crotchety old Irish priest, and in The Bells of St. Mary’s it’s the luminous Ingrid Bergman as Sister Benedict, a nun who was born in Sweden and raised in Minnesota. Bergman projects equal parts wisdom and naivete, and her performance is beatific enough, at least on the surface, to make up for what the role lacks in substance. 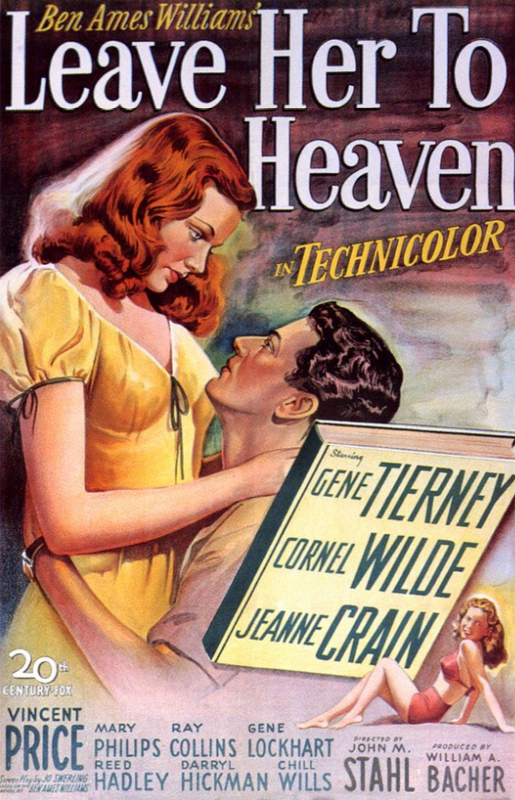 The scene in which she masters the techniques of boxing by reading a book and then teaches the sweet science to a young boy who is being bullied is both funny and touching. Crosby builds on his characterization of Father O’Malley. He’s a little older and wiser than he was in Going My Way, but not much else has changed. He’s still a “modern” thinker. He’s still a magnet for young girls in trouble, and if someone has a problem that can be solved with a song, he’s still happy to sit down at a piano and lend his golden pipes to the situation. Crosby will never be mistaken for Laurence Olivier, but he’s believable and charismatic in this picture. Enough so that he can deliver lines like, “If you’re ever in trouble, just dial ‘O’ … for O’Malley,” and not automatically trigger the viewer’s gag reflex. The world of The Bells of St. Mary’s is much like our own, but the problems in it are solved with broad strokes and last-minute changes of heart instead of time and hard work. All it takes to mend a broken family is simply locating the wayward father, and getting a new parish is no harder than praying for it (and cajoling an old millionaire to donate his latest high-rise condominium). Going My Way and The Bells of St. Mary’s are both holiday classics, even though neither focuses too much on Christmas. There’s a cute scene in The Bells of St. Mary’s in which some very small children stumble and improvise their way through a rehearsal of a Christmas pageant, but that’s about it. Oh, and a year later, astute viewers will be able to spot The Bells of St. Mary’s on the marquee of the local movie house in Bedford Falls when Jimmy Stewart runs through downtown wishing everyone and everything a Merry Christmas at the end of It’s a Wonderful Life. Posted in 1945, December 1945 and tagged Bing Crosby, Drama, Dudley Nichols, Family Films, George Barnes, Going My Way, Harry Marker, Henry Travers, Holiday Films, Ingrid Bergman, Joan Carroll, Leo McCarey, Martha Sleeper, Rhys Williams, Richard Tyler, RKO Radio Pictures, Robert Emmett Dolan, Ruth Donnelly, The Bells of St. Mary's, Una O'Connor, William Gargan. Bookmark the permalink.